Both countries have an interest in Afghan stability post-2014. They should consider cooperation. As NATO forces continue the process of withdrawing from Afghanistan, the People’s Republic of China finds itself in a conundrum. With tensions flaring throughout the Asia-Pacific, in part because of a more aggressive Chinese foreign policy, the last thing Beijing wants is to face a security risk along its western border. 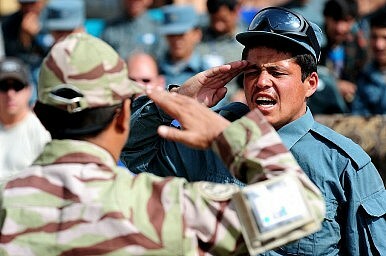 Regardless of Beijing’s wishes, it will need to become more involved in efforts to stabilize Afghanistan. The United States and its international partners thus have an opportunity to provide incentive for China to become a more reliable international security participant. Unfortunately, China seems unable to escape the inertia of its own politics, while the United States is increasingly consumed by concerns involving Chinese activities in the Asia-Pacific. The U.S.-China relationship is certain to define 21st century international relations to a great degree. As such, the two countries, as well as the world, are scrambling to better understand the relationship. China’s complaints about bilateral ties stem from a view that the United States is unfair to rising powers and, in particular, disregards Chinese traditions and history. The U.S. position is framed as one where China is an irresponsible stakeholder within the international system. China is content to free-ride off the efforts of others, while exploiting the goodwill of surrounding countries and global powers. These portrayals aren’t completely inaccurate in either case, but they do not sufficiently define this bilateral relationship. It is undeniable that trust between the U.S. and China is low and that many parties within both countries see each other as opponents. Yet, much of the tension in the U.S.-China bilateral relationship is linked to territory, commerce, and relationships throughout the Asia-Pacific region. If we move beyond the Asia-Pacific, then greater opportunity for cooperation exists. As such, the future of Afghanistan offers an opportunity for these two major powers to work together in furthering Afghan national – as well as South and Central Asian regional – security. With the majority of NATO forces to leave Afghanistan in 2014, China is realizing that its investments in Afghanistan will be at risk, its Central Asian trade threatened, and its relations with Pakistan strained. In short, China needs to take steps to protect its interests. The U.S., its population exhausted from war and its politics focused on domestic problems, is consumed with withdrawing its security forces from Afghanistan. However, Washington does not wish to watch Afghanistan fall into absolute chaos. Not only would it be negatively affected by the further loss of life, but it would also make the country’s years of investment meaningless and create a security vacuum that may once again require a major U.S. presence. Thus, China wants to protect its Western border and the U.S. wishes to find a means to enhance Afghan security. This issue can be a basis for building cooperation between the two countries, while avoiding the tension stemming from the Asia-Pacific. Unfortunately, neither country is focused on the Afghan issue in respect to the other. That must change. Too many in the United States view China as an inevitable strategic opponent, ignoring counterevidence in favor of a quasi-Cold War worldview. Likewise, many analysts in China argue that the United States is a diminishing power intent on inhibiting China’s growth. Neither country should be so easily caricatured as such. Both countries’ foreign policy establishments constantly debate how to move forward bilateral relations. What both countries need to do is recognize mutual interests. Mutual interests, particularly outside the Asia-Pacific region, should be the source of U.S.-China international cooperation. In the security arena, Afghanistan’s stability is a major threat and a vital opportunity. Could Trump Actually Start a Nuclear War?Time to Go 'Huge'? What Will Trump’s Defense Policy in Asia Be?Is the Taliban’s Former Capital Ready to Welcome Them Back?Afghanistan’s Most Vulnerable WomenCan the Afghan State Survive the Peace Process?